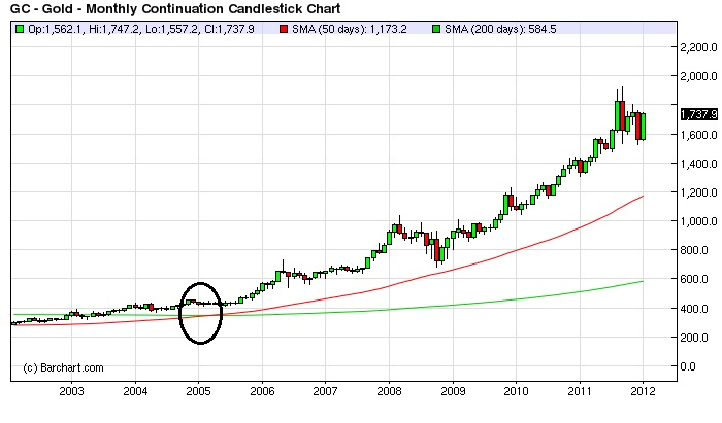 Technical analysts define the "Golden Cross" as the chart feature that occurs when a security's short-term moving average (such as the 50-day simple moving average) breaks above its long-term moving average (such as the 200-day simple moving average) or resistance level. Long-term indicators carry are considered to have more weight, so crossing the longer-term average by short-term average price line is a significant indicator of a change in momentum. The Golden Cross indicates a bull trend may be starting and is confirmed by higher trading volume. The long-term moving average becomes the new support level in the rising market after a Golden Cross. The S&P500 index is approaching a Golden Cross now. If it happens, some analysts will forecast a new bull market for stocks. And they will have the numbers on their side. The S&P500 has produced 16 "golden crosses" since 1962, 75 percent of which were followed by positive returns in the next six months, with gains averaging 4.4 percent, according to historical studies. There were 26 instances in the past 50 years when the S&P500's short-term average crossed above the long-term measure. The data show the index rose 81 percent of the time with an average increase of 6.6 percent in the next six months. 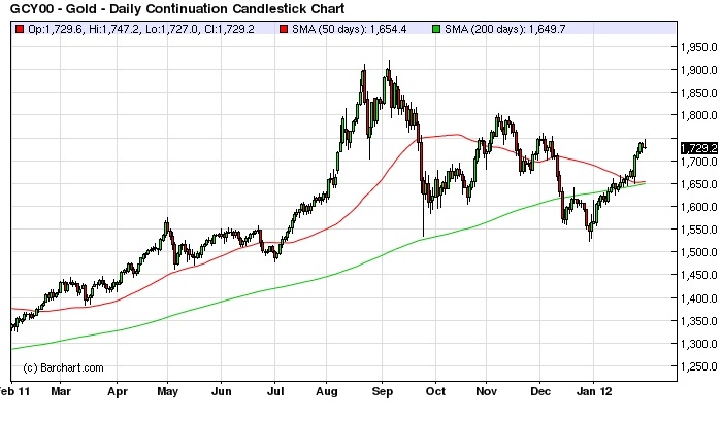 We can also see the Golden Cross in the great bull market for gold. The last occurrence of the 50/200 crossover can only be seen on the monthly basis chart. It occurred back in 2005. Since then, the price of gold on the spot market has moved up from $348/oz to $1734oz today, a 398% percent increase. Investors who spotted the start of the great bull market in gold early on have done very well. But what about now? Is there more profit to be had in gold and the precious metals going forward? Can I determine the best time to enter the market? I say yes, and we can use the Golden Cross concept to pinpoint profitable trading opportunities. Here's how. We use technical analysis tools which are based on momentum, the best of which, in my opinion, is Ichimoku Kinko Hyo combined with MACD. The Ichimoku Kinko Hyo is a well established technical trading system developed by Goichi Hosoda in the 1930's. Today, it is used by almost every securities trader in Japan, Asia and a growing number in Europe and North America. The indicator can be found on most trading platforms. Ichimoku Kino Hyo translates from Japanese to mean "one glance equilibrium chart". It gives the analyst, at once, the trend and momentum of the market, and a good forecast of future price action, as if he could see everything at an instant. The key to Ichimoku Kinko Hyo is crossovers. That is, four of the five components that comprise the system are comprised of short-term and long-term moving averages. Two establish support and resistance levels and are represented by the "cloud", or moku. Two others (Tenkan Sen and Kijun Sen) establish trend. The fifth component, known as the Chikou Span, is not an average, but measures momentum. 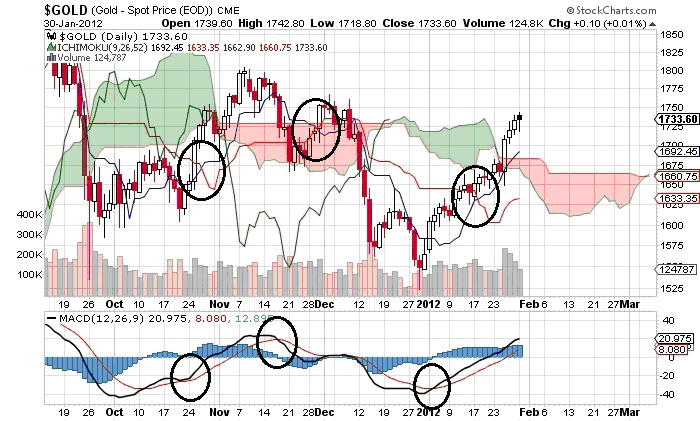 Like the Golden Cross, crossovers by Ichimoku Kinko Hyo indicators signal changes in momentum. But the Ichimoku Kinko Hyo indicators provide much more information than the cross by a short-term simple moving average and a longer-term simple moving average. Ichimoku Kinko Hyo provides valuable trading information. It can tell the speculator when to enter the market with the best chance for profit. So let's examine the case for gold using Ichimoku Kinko Hyo and its trading discipline. A look at the daily spot gold chart with 50/200-day moving average indicators shows no Golden Cross events over the last year. Also, support and resistance levels are not evident. Price action suggests the long-term trend is bullish, but more recent price action shows some consolidation. There is little information here to support a decision to trade. Now let's see what Ichimoku Kinko Hyo says about spot gold. There is much more information here. To the uninitiated, it may seem confusing. But to the skilled trader, it provides almost everything needed for profitable trading. Here's what I see from this single chart. There have been two high probability buy signals and one high probability sell signal over the last four months for spot gold. These correspond to crossovers of the Tenkan Sen (blue line) and the Kijun Sen (red line) moving averages. The trading rule is momentum turns bullish when the Tenkan Sen crosses the Kijun Sen from below. We can see this buy signal with a bullish crossover on October 26th and another on January 17th. Likewise, momentum turns bearish when the Tenkan Sen crosses the Kijun Sen from above. This sell signal occurred on November 29th. High probability trading requires confirmation by other indictors. Ichimoku Kinko Hyo provides these by the Chikou Span (green line), and price action in relation to support and resistance levels, displayed by the cloud, or "moku" (shaded areas of the chart). There are trading rules associated with each of the five Ichimoku indicators. Trading volume and the MACD are two separate indicators that support the decision to trade. We can see that crossovers of the MACD tend to lead Ichimoku crossovers. The aggressive trader can act on MACD crossovers for timing trades. The conservative trader will use Ichimoku to trade into the meat of a momentum move. Using the technical trading tools Ichimoku Kinko Hyo and MACD has produced excellent results in trading gold, silver and other commodities. These are golden crossovers that work.